You are here: HomenextTopicsnextOverseas MissionnextDid the Primitive Methodists have the equivalent of JMA? - and if so did they have their own medals? The Wesleyan JMA was put on a surer footing in 1903 with the introduction of medals and bars. But what about the Primitive Methodists ? PMs had juvenile collectors and boxes but I find no record of medals. The earliest missionary boxes, made of wood, were PM (there are several examples at Englesea Brook Museum). In Primitive Methodist Missionary Notices in the 1850s there are references to a Children’s Magazine (1851-2) and a Juvenile Magazine (1852-9) in connection with contributions to an Australian Fund. So yes, PMs had an “equivalent of JMA”. I am grateful to Revd John R Pritchard for providing the answer to this query. 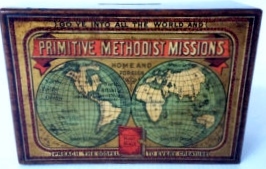 The PM Missionary Society was founded in 1843. Evidence has now been found, which shows that the first PM missionary medal was awarded in 1924. There were medals awarded. I am in the process of putting together a page with a fellow collector who has a couple of the medals and has kindly sent me pictures of them. They were not the same style as the Wesleyan medals but did have year bars again of a different design. Interestingly the Wesleyan bar for 1932-33 is a “double year” and my colleague thinks this was to bring the Wesleyan and Primitive awards in line with each other. It is incredibly difficult to find anything about the awards but we are gradually teasing more details out.